We had a great crowd at Happy Hour last night and many stayed and threw something on the BBQ and enjoyed dinner as a group. I have been asked many times - what happens at Happy Hour on Wednesdays? 1. 4 pm - Stretching Class with Frankie in the clubhouse - she manages to get everyone limbered up so they can "Belly up to the Bar"
2. 4:30 pm - The non-stretchers arrive with snacks and their favorite beverage, gathering at various tables in the clubhouse. Draft beer available for a donation. 3. 5:30 pm - The BBQ is lit out back to get warmed up for those who want to cook their dinner. 5. 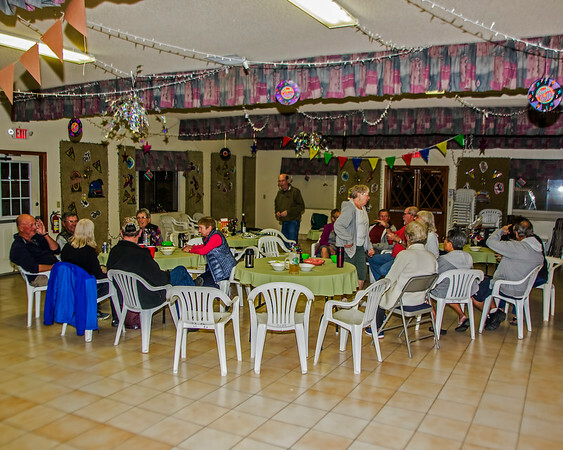 4:30 - 8:00 pm - Friends gather and share adventures and experiences and enjoy casual conversation which enjoying snacks or later a fine BBQ dinner. 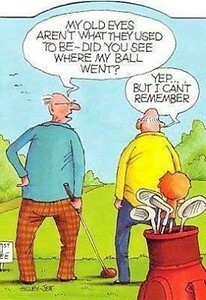 There is always discussion regarding the quality of play next door at the golf course! We also discuss upcoming events and we have some good ones this week! This Saturday evening dinner is baked pork chops with scalloped potatoes and vegetable and salad and bread. Ice cream for dessert. With our DJ and dancing after dinner. Sunday the clubhouse will be open for football - with the first game starting around noon and will stay right through the second game. See our full monthly activity schedule below!